The Bank of Russia has released a record-heavy coin to celebrate its 150th anniversary. Georgy Luntovsky, deputy chief of the Central Bank of the Russian Federation unveiled the coin worth 50,000 rubles ($1,660) to the general public yesterday. The coin, which is said to become available on June 12th, is made of 999-carat gold. “Originally, we intended to make a coin weighing 150 kilos in connection with our date, but later shelved the idea,” the official joked. The Bank of Russia will release only 50 of such coins. Twenty-five of them have already been made. 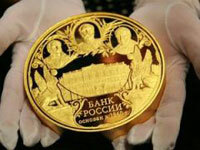 Mr. Luntovsky added that the interest to special gold coins this year was lower than before. However, the bank expects an increase of interest in its new release after prices on gold started growing again. The new coin can be owned only by wealthy collectors. Commerce banks will have to pay the price of gold plus a commission for production costs. One gram of gold today costs 1,187 rubles (about $40). Therefore, a five-kilo coin will cost not less than 6 million rubles ($200,000, the price includes a 10-percent commission of the bank). Nevertheless, the new gold coin already has its first customer. It is the Central Bank, which purchased two coins from itself for its own museum. Aleksey Ulyukaev, first deputy chairman of the Central Bank, intends to purchase another one, although he will have to pay a higher price for it. “We are going to sell the coins through commerce banks, where they can be acquired by employees of the Central Bank too. We will not have a special discount price for them, though,” Luntovsky said. It is worthy of note that Russia’s most valuable coin does not beat world records. China released a coin worth 100,000 yuans on the threshold of the Olympic Games in Beijing. The Chinese coin was twice as heavy as the Russian one. China released only 29 of such coins; one of them was sold in Russia. The world’s largest coin weighing 100 kilos was made in Canada.